This the story of a half-wit, Barnaby, and how he was tricked into joining the Gordon Riots in London. Barnaby’s poor mother has a terrible secret and a dark past that haunts her. Other characters include gruff Mr. Willet, the village innkeeper, and his son, Joe, who is in love with the locksmith’s daughter, Dolly. At the same time, delicate Miss Haredale is involved in a forbidden courtship with the son of her uncle’s sworn enemy, and the star-crossed lovers ask Barnaby to pass messages and notes for them. The disgruntled apprentice, Simon Tappertit, and the unsavory stableboy, Hugh, are instrumental in inciting the London riots, along with a hangman named Dennis who conceals his true profession from his companions in the riots. I hated this story so much. I could barely force myself to read to the end. 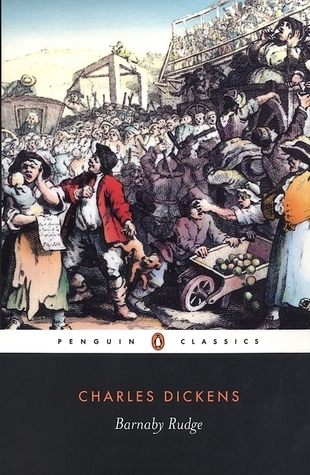 Usually I LOVE Dickens, but this book has so many problems. First of all, the riots themselves were first boring, then awful and disturbing. I got so bored with all the plotting and secrets from various bad guys throughout the first half of the book, and then I was disgusted with all the atrocities committed by the rioters in the second half. Ugh. Not enjoyable to read. Secondly, the villains get all the “screen time.” In a normal book, you’ll usually see about 70-80% of the scenes that feature the heroes, and maybe 10% that feature just the villains, plotting and being dastardly on their own, and then another 10-20% are the heroes and villains interacting and fighting, etc… But this book is very heavily focused on just the villains. I would not be exaggerating to say that 90% of this book is just about the villains, their plotting, their secrets, their evil deeds, their interactions with other villains. With the result that the villains are all fully-defined characters, and the heroes are a bunch of faceless nobodies. I did not like a single character in this entire book, because none of the heroes (men or women) are developed properly. They are introduced and described and then tossed aside into the background, then they emerge a couple of times just so you don’t forget who they are; they do a brief scene and disappear again, and then they come around to do one heroic deed out of nowhere, and they ride off into the sunset. Who the hay are you, hero? What have you been doing in the background all this time? Even the villains are poorly developed. They are described in detail, and we get to hear all their conversations and dialogue and intrigue, but they don’t grow or change or have any development. There is no progress, no maturing. And for a character-driven reader like me, that is the death of the book. I didn’t like this book, because I had no one to cheer for. Did they die? I don’t care, because I don’t really know them. Did they get kidnapped? Whatevs. Did they get hanged for crimes during the riots? Don’t really care. I’m so glad this is over. I’m beginning to learn that the great masters of the written word follow the “when it was good, it was very very good; but when it was bad, it was horrid” rule of life. I thought “Hard Times” was my least favorite Dickens novel, but this one takes the prize!